Gorkhaland Territorial Administration, which has not been able to repair three battery-operated cars for the past one year, today introduced a fleet of four luxury buses and four SUVs that can be hired by tourists and local people. The buses, two Innovas and two Tata Sumos have been bought for about Rs 1.07 crore. 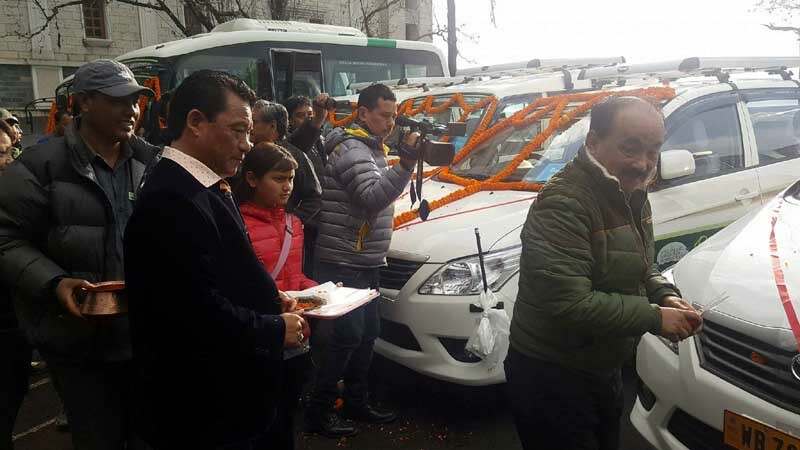 Bimal Gurung, chief executive of the GTA, who announced the launch of the vehicles, said: "We are introducing these vehicles for tourists and local people." He admitted that the hill body had not worked out a proper contract for the battery-operated cars. "It is true that the battery cars have been grounded. We will get them repaired soon. I have told my officials that a proper maintenance agreement should be worked for the (new) vehicles so that they do not become like the battery cars." The two luxury buses, each with a capacity of 13 passengers, can be hired to go to New Jalpaiguri station from Darjeeling. One bus has been earmarked for Bagdogra airport and the other will be used for conducted tours to Mirik. The two Innovas can be hired for going to Tiger Hill and local sightseeing. The Tata Sumos are for Mungpoo and Jamuney visits. "The rates have not been fixed yet but we will ensure that they are slightly lower than what is charged by private tour operators. The entire vehicle will have to be booked at a time," said a GTA tourism department official. The GTA had purchased four eight-seater battery cars for Rs 36 lakh in April 2015. Three vehicles had been handed over to the transport department in Darjeeling and they used to ply between the Gorkha Rangamanch Bhavan and Padmaja Naidu Himalayan Zoological Park. One car was sent to Deolo Tourist Lodge in Kalimpong. After about six months, the three cars in Darjeeling were grounded. The four cars had collected a total of only about Rs 3.5 lakh before they were grounded January 2016. The cars had developed problems with the battery and even though the GTA's transport department has four mechanics, none of them were trained to repair the vehicles. "We contacted the firm that had supplied the vehicles and sometime ago, they inspected the battery cars. We would need Rs 8 to 9 lakh for the repairs. The GTA has sanctioned the amount and soon these cars will be repaired," said a GTA official. "We believe that an annual maintenance contract has to be worked out for the cars," an official said. The GTA's move to launch the new vehicles has baffled many in the tourism sector who said the hill body should focus on creating more tourist spots that would encourage unemployed local youths to buy such vehicles.